With a van full of audio, lighting and staging gear, Spectrum’s two-person crew arrives at Phoenix Sky Harbor International Airport with plenty of time to prepare for the arrival of the Baylor University football team for the 2016 Cactus Bowl. The oversized white event tent is already in place at the executive terminal, but hasn’t started bustling with activity yet. A rare morning of rain in the Valley of the Sun, means the crew needs to be careful as they set up the audio and lighting gear. Everything in the tents runs off one generator – from the food warming plates to the audio board – which is located outside on the wet tarmac. And, they need to make sure they aren’t positioning anything too close to the space heaters in the tent. The Cactus Bowl, officially the Motel 6 Cactus Bowl for sponsorship purposes, is an NCAA Football Bowl Subdivision college football bowl game that has been played in Arizona since 1989. The Baylor Bears (6-6) will face the Boise State Broncos (10-2) Dec. 27 at Chase Field. And, Baylor University has already tweeted they are on their way, so Dave Thompson and Brian Weldin expect they have a few hours before the plane arrives. hang the Cactus Bowl logo banner on it. The podium gets a mic for the coach, and with plenty of competing signals in a modern airport, they double-check the wireless frequencies on the two handheld mics to be passed among the audience at the national media event. A 12-channel audio mixer feeds a recorder, and a 12-channel audio Mult-box for direct mic and line-level, feeds to the press. With sound checks complete, they wait. By now the tent and tarmac are buzzing with Fiesta Bowl Yellow Jackets (committee members who host both bowl games), mascots and a band waiting to greet the coaches and players. Once that plane lands and the team arrives, it’s exhilarating (and not only for our crew, because the team has landed almost an hour early on the private charter). 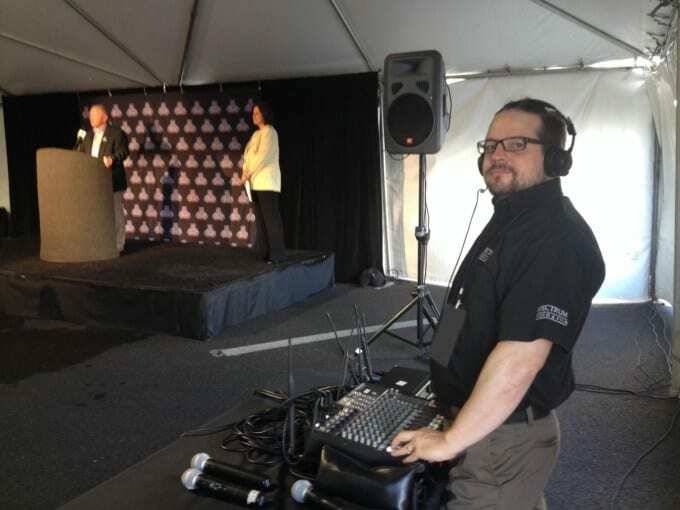 As the excitement begins, Spectrum’s audio engineer is ready, since he knows multiple media outlets are counting on him for a crisp and clear audio feed as the coach makes his welcoming remarks and takes a few questions. Once the coach exits the stage, the Spectrum crew prepares for the Boise State Broncos arrival the next day. They pack up some of the gear, leave most of it in place and grab a snack from the media food table. Then it’s back to the JW Marriott Scottsdale Camelback Inn, to continue setting up the complex media event needs for both the Cactus and Fiesta Bowl requirements in the days ahead. The pomp and pageantry of college football bowl game excitement is alive in the damp desert air, and Spectrum Video & Film is there, providing essential AV support for national media needs. Article by Ken Liljegren, owner and president of Spectrum Video & Film. Spectrum Video & Film is a professional video production company in Scottsdale and Phoenix, AZ specializing in corporate, commercial, online social media videos and more! To find out more about how we can help with your next video or event, visit us at spectrumvideoandfilm.com.